Fred Ahlert was born in New York City and completed his education at Fordham Law School. Switching from law to music, Ahlert began work as an arranger for composer and bandleader Fred Waring. He eventually transitioned to full-time composing, producing two major hits. The first, “I’ll Get By,” sold over a million copies of sheet music. In 1928 he became convinced he should start his own publishing company and in 1929 he published his second major hit, the top jazz standard “Mean to Me.” Ahlert was Director of ASCAP for twenty years, and the Fred Ahlert Music Corporation is still in operation today. 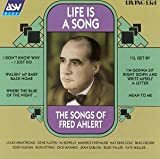 Songs in the Ahlert catalog include “I’ll Get By (As Long As I Have You)” (1928), “Walking My Baby Back Home” (1930), “I Don’t Know Why (I Just Do)” (1931), “Where the Blue of the Night Meets the Gold of the Day” (1931), and “I’m Gonna Sit Right Down and Write Myself a Letter” (1935). Nat King Cole Contains "Walking My Baby Back Home"
Bing Crosby Contains "Where the Blue of the Night..."